BICKER. On January 23, at Gozo General Hospital, MICHAEL JOHN of Fontana, Gozo, aged 70. He leaves to mourn his loss, his wife Tess, his children Christopher and his wife Josianne, Karin and her husband Dr Steve Cordina, his sisters Patsy and Noreen, his grandchildren Nathan, Alex, Katie and Julian, other relatives and friends. The funeral leaves Gozo General Hospital tomorrow, Friday, January 25, at 3.30pm, for Fontana parish church where Mass præsente cadavere will be said at 4pm, followed by interment in the family grave at St Mary’s Cemetery. Lord, grant him eternal rest. BONNICI SOLER. Suddenly, on January 22, MICHAEL, com-forted by the rites of Holy Church. He leaves to mourn his loss his beloved brother Antoine, his loving cousins Clare Hobbs, Jo Ann Camilleri, Marie Farrugia and Raymond Bonnici and their respective families. He also leaves to mourn Maurizio Basile and his other numerous friends. The funeral leaves Mater Dei Hospital tomorrow, Friday, January 25, for St Gregory’s parish church, Sliema, where Mass præsente cadavere will be said at 2pm, followed by inter-ment at Santa Maria Addolorata Cemetery. No flowers by request but donations to the Malta Dementia Society, University of Malta, will be appreciated. Lord, grant him eternal rest. BORG. On January 20, at Mater Dei Hospital, PHILIP (former teacher at Liceo Vassalli, Tal-Ħandaq and the Archbishop’s Minor Seminary, and ex-director of the Department of Libraries and Archives), of Marsa, residing in Mosta, aged 70, passed away peacefully comforted by the rites of Holy Church. He leaves to mourn his great loss his wife Maria, née Sammut, his children architect Daniel and his fiancée Vanessa, notary Dr David Joseph and his wife Luisa, Dr Marika and her fiancé Matteos, his sisters, his brothers-in-law, other relatives and friends. he funeral leaves Mater Dei Hospital on Saturday, January 26, at 7.45am, for the Basilica of the Assumption of Our Lady, Mosta, where Mass præsente cadavere will be celebrated at 8.30am, followed by interment at Santa Maria Addolorata Cemetery. No flowers by request but donations to Id-Dar tal-Providenza, Siġġiewi, will be greatly appreciated. Lord, grant him eternal rest. CALLEJA. On January 22, at Mater Dei Hospital, FRANCESCA of Sliema, aged 79, passed away peacefully comforted by the rites of Holy Church. She leaves to mourn her great loss her daughter Louise and husband Alex, her daughter Christine and husband Keith, her daughter Alexandra, her son Malcolm and partner Roberta, grandchildren, other relatives and friends. The funeral cortège leaves Mater Dei Hospital tomorrow, Friday, January 25, at 7.45am, for the Carmelite parish church, Balluta, St Julian’s, where Mass præsente cadavere will be said at 8.30am, followed by interment at Santa Maria Addolorata Cemetery. Donations to Hospice Malta, Balzan, will be greatly appreciated. Lord, grant her eternal rest. CAMILLERI. On January 23, at Mater Dei Hospital, GAETANO, aged 60. He leaves to mourn his loss his wife Lorraine, née Thompson, his daughters Elaine and her husband Domenico Mirabile and Daniela and her husband Dr Matthew Xerri, his grandchildren Diego and Giulia, his brothers and sisters, other relatives and friends. Mass præsente cadavere will be said today at 10am at Our Lady of Sorrows church, Ħamrun, followed by interment in the family grave at Qrendi cemetery. The family regret they are unable to receive visitors. Lord, grant him eternal rest. CARUANA DEMAJO. On January 23, at Mater Dei Hospital, MARIA, aged 99, passed away peacefully comforted by the rites of Holy Church. She leaves to mourn her loss her only son Giannino and his wife Evelyn, her niece Antoinette and her husband Thomas Abela, other relatives and friends. The funeral cortege leaves Mater Dei Hospital tomorrow, Friday, January 25, at 8.30am for St Cajetan parish church, Ħamrun, where Mass praesente cadavere will be said at 9am followed by interment at Santa Maria Addolorata Cemetery. Lord, grant her eternal rest. DEBONO. On January 23, at her residence, DORIS of St Paul’s Bay, passed away peacefully at the age of 84, comforted by the rites of Holy Church. She will be greatly missed by her husband Anġlu, her son Johnny and his wife Angela, her granddaughter Daniela, Vivie, widow of her brother Karmnu, Josephine, widow of her brother Frans, her in-laws and their families, other nephews and nieces, cousins, other relatives and friends. The funeral cortège leaves Mater Dei Hospital on Saturday, January 26, at 7am, for Our Lady of Sorrows (Marija Addolorata) parish church, St Paul’s Bay, where funeral Mass præsente cadavere will be said at 8am, followed by interment at the Divine Mercy (Ħniena Divina) Cemetery, St Paul’s Bay. No flowers by request but donations to Id-Dar tal-Providenza, Siġġiewi, will be greatly appreciated. Lord, grant her eternal rest. GRECH. On January 22, at Sir Anthony Mamo Oncology Centre, MARY, aged 86, passed away peacefully comforted by the rites of Holy Church. She leaves to mourn her loss her sons Louis and his partner Jean, Frederick and his wife Nadine, Stephen and his wife Miriam, Ray and his wife Emily, and her daughter Irene and her husband George, her grandchildren, nephews and nieces, relatives and friends. The funeral leaves Mater Dei Hospital today, Thursday, January 24, at 1.30pm, for Stella Maris parish church, Sliema, where Mass præsente cadavere will be said at 2pm, followed by interment at Santa Maria Addolorata Cemetery. No flowers by request but donations to Id-Dar tal-Providenza, Siġġiewi, will be appreciated. Lord, grant her eternal rest. MICALLEF. On Saturday, January 19, FRANCIS SAVIOUR, director of Tutto Marketing Ltd and President of the Għaqda Festi Esterni Ssma. Trinità, Marsa, aged 56, passed away suddenly in Milan, Italy, while on a business trip with his wife. Loved and remembered by his wife Carmen, his daughters Annabella and Amber and her husband Salvatore, his brothers and sisters and their respective spouses, his in-laws and their families, nephews, nieces, relatives, employees, friends and also the committee and members of the Għaqda Festi Esterni Ssma. Trinità. The funeral leaves Mater Dei Hospital on Sunday, January 27, at 12 noon, for the Holy Trinity parish church, Marsa. A cortège will take place at 1pm and Mass præsente cadavere will be said at 2pm, followed by interment in the family grave at Santa Maria Addolorata Cemetery. Flowers are welcome, as well as donations to Saviour’s favourite charity, Puttinu Cares. Lord, grant him eternal rest. NAVARRO. On January 23, at St Vincent de Paul residence, GIUSEPPI of Msida, aged 94, passed away peacefully comforted by the rites of Holy Church. He leaves behind to mourn him his son Anthony and his wife Doris, his son Charles and his wife Antoinette, his son Manuel and his wife Josephine, his daughter Maria, his son Mark and his partner Sharon, his daughter-in-law Carmen, and his many grandchildren and great-grandchildren. The funeral cortège leaves Mater Dei Hospital on Saturday, January 26, at 7.30am for Msida parish church, where Mass præsente cadavere will be said at 8am, followed by interment in the family grave at Santa Maria Addolorata Cemetery. Giuseppi joins his late wife Carmela and his first-born son Joseph in eternal peace. Lord, grant him eternal peace. The family extend their deepest thanks and appreciation to the staff at St.Joseph Ward 1, St Vincent de Paul residence for the care and attention shown to our wonderful Giuseppi Navarro. WARRINGTON. On January 19, Dr FRANCA WARRINGTON, née Zammit Hammet, widow of Alexander, aged 83, passed away peacefully at Casa Antonia, Balzan, comforted by the rites of Holy Church. She leaves to mourn her loss her daughters, Shirley and her husband John Mansfield, Sr Francis Hilary OSC (Poor Clare), Isabelle, and Monica and her husband Mohamed Mokhtari, her grandchildren Sarah, Catherine, Lizzy, Daniel, Fiona, Hannah, Clara, other relatives and friends. 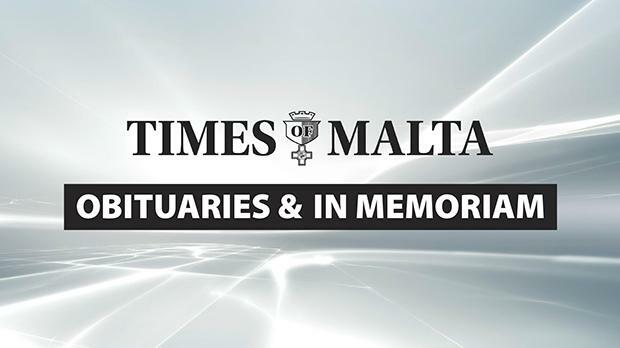 The funeral leaves Casa Antonia on Saturday, January 26, at 8am, for Balzan parish church, where Mass præsente cadavere will be said at 8.30am, followed by interment at Santa Maria Addolorata Cemetery. No flowers by request but donations to St Clare’s Monastery, St Julian’s, will be greatly appreciated. Lord, grant her eternal rest. ABELA – Lieut. CHARLES ABELA, KOMR. In memory of a dearly loved father. His sons and daughters. ASCIAK – WILFRID. In loving memory of a wonderful husband, father and grandfather on the third anniversary of his demise. Forever in our thoughts and prayers. Sorely missed by his wife Marion, his children, in-laws and grandchildren. Lord, grant him eternal rest. AZZOPARDI. In loving memory of our dear beloved parents and grandparents VIOLET and JOE. Fondly remembered on the anniversary of their death by their children Monique, Carmencita, Mariella, Ray and Claude and their respective spouses and grandchildren. Please remember them in your prayers. CALLEJA. Treasured memories of JOHN on the 14th anniversary of his demise. No one who has ever been loved is ever lost – for John lives on forever in our hearts. Sadly missed by his wife Winniefred and his daughter Stephanie. De BONO. Treasured memories of our dear father JOE, today the 49th anniversary of his demise. Lovingly remembered by his children Ronald, David, Johanna and Sue. MANARA – RICHARD (Daddu). In treasured memory of our beloved father who died on January 24, 1952. Liana and Victor, Mireille and Norman, Edward. MIFSUD. In loving memory of our dearest father RONALD (Mifsud Brothers Ltd) on the first anniversary of his passing away to eternal life, January 25, 2018. Sadly missed by his sons Ivan, Mark and Matthew, their spouses, his brothers Norman and Derek, and grandchildren. A Mass for the repose of his soul is being celebrated tomorrow, Friday, January 25, at 6.15pm, at the Millennium chapel (main church), Paceville. Lord, grant him eternal rest. MUSCAT – Professor JOSEPH ANTHONY MUSCAT, MD, FRCS. In loving memory of a beloved husband, father and grandfather on the second anniversary of his demise. Greatly missed and always remembered in our thoughts and prayers, may he rest in peace. His wife Joan, his children Richard, Mark, Jonathan and Sarah, their spouses Suzanne, Janet and Morgan and his grandchildren, Michael, Daniel and Steve, Nicholas, Lexy and David. Today’s 6.30pm Mass at St Patrick’s church, Sliema, will be offered for the repose of his soul. PETROCOCHINO. In loving memory of my beloved MAURICE, every day and especially today, the eighth anniversary of his passing. Liliana. PETROCOCHINO – MAURICE. A doting father and grandfather. Sorely missed by Albert, Rita, Bianca and Maria. PETROCOCHINO – MAURICE. In memory of a much loved husband, father, grandfather and great-grandfather. Mass for the repose of his soul will be said today at 6.30pm at St Dominic’s church, Rabat. ROSSO – JOSEPHINE. Re-membered with love and greatly missed on the fifth anniversary of her demise. Forever in our hearts. Her daughter Alida, husband Edward, their children and grandchildren. ZAMMIT. In loving memory of my dearly beloved mother INGRID on the third anniversary of her passing away. Still so loved and so deeply missed. Her only son, Karl. ZAMMIT – INGRID. In loving memory of my dearest friend on the third anniversary of her demise. Lovingly remembered and deeply missed. Christine.